The U.S. Census Bureau reported last month that state tax collections in FY 2011 reached $764 billion, an increase of 8.9 percent over 2010. The amount is the second-highest ever, behind only the $781 billion collected in the bubble year of 2008. Each state saw growth in tax collections, in amounts ranging from 0.4 percent (Hawaii) to 44.5 percent (North Dakota) (see Table 1). Individual income taxes, excise taxes, and sales taxes led growth, while property tax collections dropped due to assessments catching up with depressed home values. 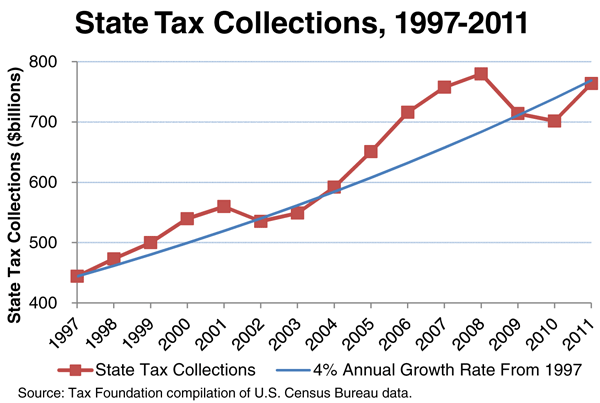 Even accounting for the drop in state tax collections due to the recession, strong pre-recession growth means that state taxes have grown at a healthy 4 percent annual rate from 1997 to 2011 (see Figure 1). State budget gaps occurred because state spending relied on revenue projections growing at an unsustainable 8 percent per year. The consequent correction has been termed the “New Normal”: an era where state officials must make do with lower annual tax revenue growth, more in line with long-term economic growth. In the short term, as boom turned to bust, the combination of unsustainable spending commitments and dropping tax revenue led to opening of significant structural budget deficits in many states. States generally took one of three approaches in resolving these deficits. One group of states rolled back spending growth commitments made during previous years and took actions to spend no more than the state brings in. Arkansas and Indiana are examples of two states that took this path. A second group of states raised taxes, deciding that the benefits of sustaining state spending outweighed any economic damage that might result from tax increases. Most states taking this option aimed their taxes at specific groups such as high-income earners, tobacco purchasers, or out-of-state Internet retailers. These revenue sources may provide short term relief but can cause substantial economic harm to the state economy in the medium and long term. A third group of states adopted the politically easiest path: use one-time funds and accounting gimmicks to paper over the current state budget shortfall, without significantly curtailing spending. This irresponsible approach amounts to hoping the economy will soon recover and bring a surge of tax revenue. California and Illinois, in particular, have built their state budgets into perpetual crises. Elements of these crises include months of unpaid bills, issuing IOUs, seizing funds from local governments and dedicated accounts, borrowing, and shifting expenses into future years. California even increased business withholding rates in 2009 to 110 percent of what workers owe: in essence an interest-free loan to the state. In another notable example, Kentucky ordered 180 days of school instruction but funded only 179 days. Other steps taken by many states have included one-time federal stimulus aid, the drawdown of mostly inadequate rainy day funds, increasing abuse of federal Medicaid matching funds, the depletion of the federal-state unemployment insurance system, and significant tax changes. Current trends suggest that the worst of the economic downturn is behind us, offering an important moment for considering lessons learned about how states responded to the recession and how they will respond to its after effects. Source: Tax Foundation calculation of U.S. Census Bureau State Government Tax Collections data. Connecticut in May 2011 replaced its three-bracket system with a six-bracket system, raising the top rate from 6.5% on income over $500,000 to 6.7% on income over $250,000. Illinois in January 2011 approved a 67 percent increase in its income tax rate, from 3 percent to 5 percent. California in December 2010 let expire a temporary 0.25 percentage point increase on all income tax brackets that had been in effect for 2009 and 2010. The top income tax rate thus fell from 10.55% to 10.3%. Delaware in June 2011 approved a reduction in its top income tax rate of 6.95% on income over $60,000 to 6.75% for 2012 and 2013. The rate is scheduled to drop again to 5.95% in 2014. Maine legislators voted to reduce the top income tax rate from 8.5% to 7.95%, effective 2013. A previous tax reform effort that dropped the top rate to 6.85%, along with a variety of other changes, was rejected by voters in June 2010. North Carolina’s temporary 2 percent surtax on income over $60,000 and 3 percent surtax on income over $150,000 expire as scheduled at the end of 2010. North Dakota reduced income taxes across the board modestly, from a top rate of 4.86 percent to a top rate of 3.99 percent. Ohio reduced its income tax rates across the board beginning in 2011, reducing the top rate from 6.24% to 5.925%. The reduction completes a phased-in reduction that began in 2004, when the top rate was 7.5%. The 2011 reduction had been scheduled to occur in 2010 but was postponed one year. New York in December 2011 prevented the scheduled reduction of its top rate of 8.97% on income over $500,000 to 7.85% on income over $200,000. Rates were however reduced from this earlier level, with lower rates for income over $20,000, a rate of 6.85% on income over $150,000 and a top rate of 8.82% on income over $1 million. (See Figure 2). Figure 2. New York Individual Income Tax Brackets and Rates for Single-Filers. Michigan in 2011 adopted a significant corporate tax reform, eliminating their complicated Michigan Business Tax (MBT) and replacing it with a 6 percent corporate income tax, effective 2012. Connecticut increased its corporate income surtax, effective January 1, 2012, from 10% to 20%, which is on top of the 7.5% tax rate. Illinois adopted the fourth-highest corporate tax rate in the industrialized world in January 2011, raising their rate from 7.3% to 9.5%. (Some news reports indicate that Illinois’s rate went from 4.8% to 7.0%, not including a second 2.5% corporate income tax dedicated to replacing revenue from a repealed personal property tax. We, along with the Illinois Department of Revenue, report it as combined tax.) A prior legislative agreement to raise the corporate income tax to 10.9% failed in part due to our alert that it would be the highest corporate tax rate in the industrialized world. Arizona legislators approved a bill to reduce their 6.968% corporate income tax to 4.9% by FY 2018 in stages beginning in FY 2015. Indiana in May 2011 approved a phased-in reduction of their corporate income tax. Presently 8.5%, it will drop to 8.0% on July 1, 2012; to 7.5% on July 1, 2013; to 7.0% on July 1, 2014, and finally to 6.5% on July 1, 2015. North Dakota reduced its corporate income tax rates across the board. The top rate fell from 6.4% to 5.2%, effective 2012. Connecticut in May 2011 approved an increase in its sales tax from 6% to 6.35% (with some “luxury goods” taxed at 7%), effective July 1, 2011. California’s sales tax fell from 8.25% to 7.25% as a temporary increase expired as scheduled on July 1, 2011. North Carolina also let a temporary sales tax increase of one percentage point expire on July 1, 2011, dropping the rate from 5.75% to 4.75%. Connecticut increased its cigarette tax rate from $3.00 per pack to $3.40 per pack, effective July 1, 2011. Hawaii continued a multi-year increase of its cigarette tax rate, raising the rate from $3.00 per pack to $3.20 per pack. Vermont increased its cigarette tax rate from $2.24 per pack to $2.62 per pack, effective July 1, 2011. New Hampshire reduced its cigarette tax rate from $1.78 per pack to $1.68 per pack, effective July 1, 2011. Maine ended automatic inflation indexing of its gasoline tax after FY 2012. Connecticut reduced its exemption from $3.5 million to $2 million. Illinois reinstated its estate tax, effective January 1, 2011, with a $2 million exemption and fourteen rates topping out at 16 percent. Ohio repealed its estate tax, effective January 1, 2013. Kailee Tkacz, Connecticut Budget Approved With Numerous Tax Increases, Tax Foundation Tax Policy Blog (May 5, 2011), http://www.taxfoundation.org/blog/connecticut-budget-approved-numerous-tax-increases. Joseph Henchman & Kail Padgitt, Illinois Approves Sharp Income Tax Increase, Fourth-Highest Corporate Tax Rate, Tax Foundation Fiscal Fact No. 256 (Jan. 13, 2011), http://www.taxfoundation.org/news/show/26965.html. Joseph Henchman, New California Governor Proposes Initiative to Extend Tax Increases, Tax Foundation Tax Policy Blog (Jan. 3, 2011), http://www.taxfoundation.org/blog/new-california-governor-proposes-initiative-extend-tax-increases. Kail Padgitt, Maine Rejects Tax Reform Measure, Tax Foundation Tax Policy Blog (Jun. 9, 2010), http://www.taxfoundation.org/blog/maine-rejects-tax-reform-measure. Scott Drenkard, Maryland Considers Proposal to Extend “Millionaires Tax” to $100,000 Income Level, Tax Foundation Fiscal Fact No. 301 (May 15, 2012), http://www.taxfoundation.org/news/show/28221.html. Joseph Henchman, North Dakota Considers Budget Surplus Options, Tax Foundation Tax Policy Blog (Mar. 7, 2011), http://www.taxfoundation.org/blog/north-dakota-considers-budget-surplus-options. Joseph Henchman, Ohio Officials Agree to Cancel Income Tax Cut, Tax Foundation Tax Policy Blog (Dec. 17, 2009), http://www.taxfoundation.org/blog/show/25634.html. Scott Drenkard, New York Legislature Approves New Tax Plan, Tax Foundation Tax Policy Blog (Dec. 9, 2011), http://www.taxfoundation.org/blog/new-york-legislature-approves-new-tax-plan. Mark Robyn, Michigan Implements Positive Corporate Tax Reform, Tax Foundation Tax Policy Blog (Feb. 10, 2012), http://www.taxfoundation.org/blog/michigan-implements-positive-corporate-tax-reform. Joseph Henchman, Indiana Approves Tax Changes, Including a Corporate Tax Rate Reduction, Tax Foundation Tax Policy Blog (May 2, 2011), http://www.taxfoundation.org/blog/indiana-approves-tax-changes-including-corporate-tax-rate-reduction. 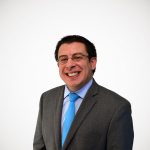 Joseph Henchman, California Has An On-Time, Balanced Budget; Sales Tax Drops, Tax Foundation Tax Policy Blog (Jul. 6, 2011), http://www.taxfoundation.org/blog/california-has-time-balanced-budget-sales-tax-drops. Joseph Henchman, Ohio Officials Look at Estate Tax Repeal, Tax Foundation Fiscal Fact No. 256 (Jan. 28, 2011), http://www.taxfoundation.org/blog/ohio-officials-look-estate-tax-repeal.